Today’s the day. As we all await the fait accompli .25% rate hike, prepare for some creative use of language as the Fed explains why inflation is no problem, everything is fantastic, but they’re raising out of abundance of caution, the economy is doing super awesome but not too super awesome but not matter what don’t worry, never worry, they’re in complete control. The Fed will hike. It’s almost certain. The market odds of such move are more than 94 percent. It implies that the lack of a hike would be significantly more disruptive than a hike at this state of market expectations. Powell will not risk upsetting the markets. As the move is practically fully priced in, gold prices shouldn’t fall on that. Actually, they may increase afterwards, as investors often sell the rumor and buy the fact. What really matters are the new Fed forecasts and Powell’s forward guidance. If history is any guide and the pattern established since December 2015 will hold, the price of gold should remain under pressure until the release of the FOMC statement and perhaps the immediate aftermath. However, after a while, the attention should return to political uncertainty about Washington trade protectionism and fiscal policy. It should allow gold prices to climb higher. 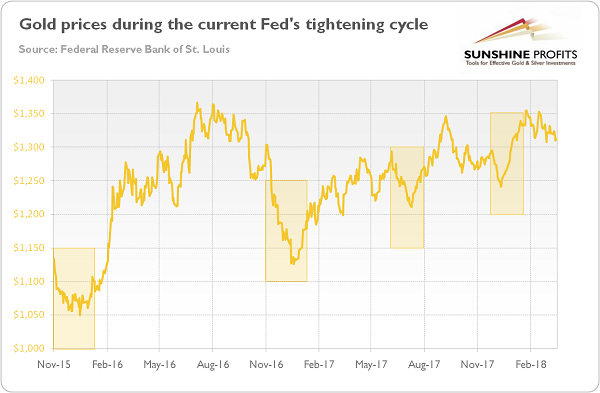 Indeed, as the chart shows, the price of gold fell ahead of the FOMC meeting and rallied soon after (the yellow rectangles mark the relevant periods) during the current Fed tightening cycle.